We strongly feel that this is one battle and we are all on the same side… just fighting on different fronts. Events are taking place all over Michigan and beyond with a singular goal: stomping out multiple sclerosis! Some of these events are hosted by the National Multiple Sclerosis Society and some are simply the brainchild of ordinary citizens with an extraordinary vision. If you have an event you would like us to highlight, please let us know about it; we’ll also add it to our online calendar with additional details, time, and location. Central Michigan University’s Stomp Out MS 5K Run/Walk event occurs in April and benefits the National Multiple Sclerosis Society, Michigan Chapter. Their April 11th, 2015 race was a great success, raising more than $5,000 for the fight against multiple sclerosis! 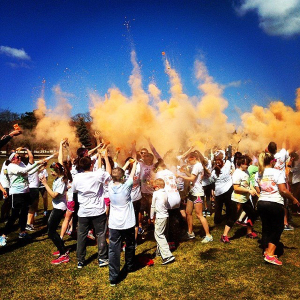 We certainly look forward to more color-filled good times on the campus of Central Michigan University. Stay tuned for more details! The Take a Breath for PH and Get Moving for MS is a unique race event in Dewitt, Michigan (just north of Lansing) which takes place on the second weekend in May. This amazing event has raised $48,000 over three years to find a cure for pulmonary hypertension and multiple sclerosis. The DeWitt run has it all: an online auction, a race day raffle, and run events for all ages. Proceeds benefit the Pulmonary Hypertension Association and National Multiple Sclerosis Society. Half-Marathon, 10K, 5K and Free Kids 1/4 Mile distances are all available… it’s a perfect event for the whole family! Rick Szczepanski created the Mary J. Szczepanski “Never Give Up” MS Scholarship to honor his mother who courageously fought MS for 38 years. This scholarship honors high school seniors and college students in the Grand Rapids area and beyond who raise money and awareness for multiple sclerosis. Bowl for MS and Miniature Golf for MS are annual charity fundraisers for the “Never Give Up” Scholarship. Visit Rick’s website, www.msscholarship.org, for additional information. 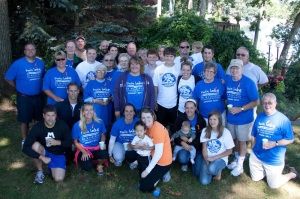 The Twin Lake 5K Walk / Run for Multiple Sclerosis takes place in Twin Lake, a small town located just northeast of Muskegon, Michigan. This mid-summer event has raised $20,000 over a four-year period to find a cure for multiple sclerosis. As of 2013, this event now benefits the National Multiple Sclerosis Society, Michigan Chapter; their June 29, 2014 race resulted in more than $5,800 raised for MS-related programs and research.